For his tireless work at the heart of an almost impenetrable Arsenal defence, retired centre-back Martin Keown is an informative and candid guest speaker for any corporate event. It was with Arsenal that the Oxford born Keown spent the best part of his career, representing the Gunners over 300 times and collecting nine major pieces of silverware in that time. They include an FA Cup and various runners-up medals in the UEFA Cup and UEFA Cup Winners Cup. Keown also played for the national side for over a decade, including games at four major Soccer finals including both the 1998 and 2002 World Cups. There were 43 international caps in all for the defender (he even managed to score two goals), often alongside domestic team mate Tony Adams. Now Martin Keown is working as a pundit for the BBC, as well as being a part-time scout and coach for Arsenal. His dedication to all sides of the game from training to tactics meant Martin rarely missed a match in his first four seasons at Highbury and became an integral part of the Arsenal team managed by Arsène Wenger, which won the double on two occasions first in 1998, then later in 2002. 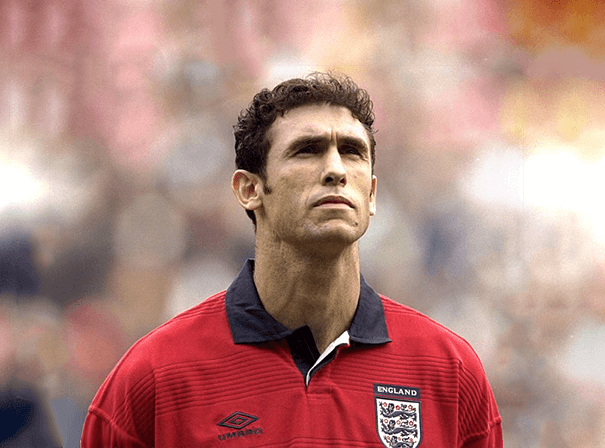 Known for his tough and uncompromising approach, Martin Keown is an old school Soccerer with old school values, perfect for motivational speeches for sportsmen, children and more. For more information, contact one of our awaiting sports agents.